"This soup is a traditional vegetable soup with a little extra. I added homemade dumplings like my mom use to make for me. She made her soup with all the leftover vegetables in the refrigerator and then added dumplings. 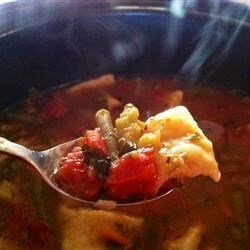 Good vegetarian soup without the meat." Combine 6 cups vegetable broth, frozen vegetables, tomatoes with their juice, potatoes, onion, barley, garlic, parsley, oregano, basil, salt, black pepper, and bay leaf in a slow cooker. Cover and cook on Low for 5 to 6 hours. Place flour in a bowl; cut shortening into flour using a pastry blender or two knives until mixture resembles coarse crumbs. Add 1/4 cup vegetable broth; stir with a fork until dough no longer sticks on sides of bowl. Transfer dough to a lightly floured surface; roll out 1/8 inch thick. Cut dough into strips or small squares. Add to slow cooker; cook until dumplings are soft and cooked in the middle, 1 hour. A cheesy French onion soup with a comforting beefy broth. Wasnt bad, but I agree with the gummy feeling/taste review of Carlin A. Wont make again but if you prefer a brothy soup, this is more of a stewy feel. soup has been cooking for 7 hrs but tastes very good, i am not adding dumplings just want a nice vegi soup. will cook longer to get the onions to cook more. This was a nice easy soup. My family liked the dumplings. I didn't have barley so I used quinoa. It came out delicious.